The Big Turn On is Coming to FJ Chalke Wincanton – WIN a Nissan LEAF, iPad2 + win charging stations for Dorset! 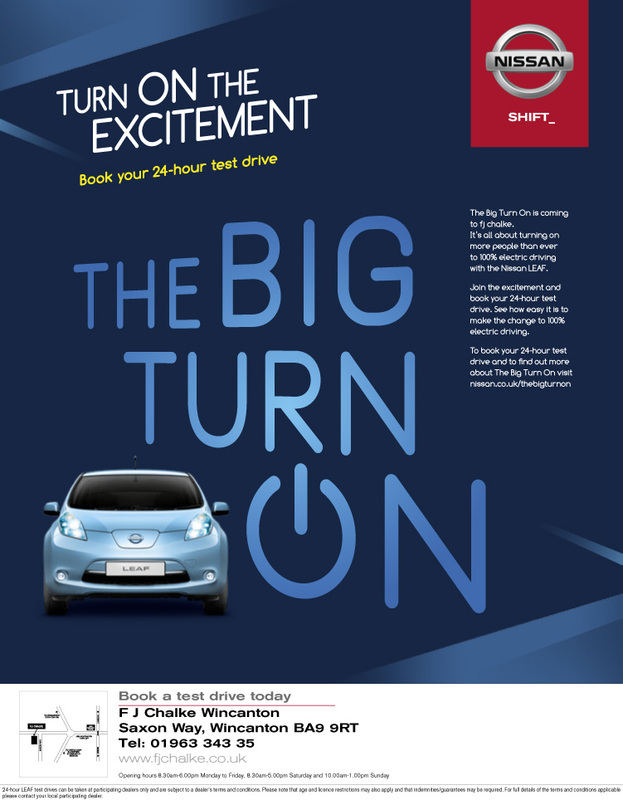 > The Big Turn On is Coming to FJ Chalke Wincanton – WIN a Nissan LEAF, iPad2 + win charging stations for Dorset! Dorset Energized partners FJ Chalke Nissan in Wincanton are encouraging drivers in the area to ‘Turn On’ to a low-carbon lifestyle for a more sustainable future. The Big Turn On is an online led campaign with the aim of getting one million people to Turn On to 100% electric driving and create their own profile page on The Big Turn On website. Once ‘Turned On’ you will be entered onto a leader board where you could WIN a Nissan LEAF and also an iPad2. You can then gain additional points by taking part in various activities and encouraging other people to ‘Turn On’ too. YOU COULD WIN CHARGING STATIONS FOR DORSET TOO! Nissan will also donate rapid charging stations to the city with the most ‘Turn Ons’. Local councils and businesses will then find the best locations to install the stations – please recommend Wincanton! ‘Turn On’ to electric driving’ by simply clicking the ‘Turn On’ button, these will add up to reaching the one million ‘Turn Ons’. Contribute to their citie’s chance of winning 30 charging points. Book a 24-hour test drive so customers can enjoy the benefits of 100% electric motoring. Create a participant page and earn credits in The Big Turn On competition for their chances to win a LEAF. View video content on different people’s experiences of driving a LEAF. Join the excitement and book your 24-hour Nissan LEAF test drive. See how easy it is to make the change to 100% electric driving. To book your 24-hour test drive at FJ Chalke Wincaton visit www.fjchalke.co.uk/eco.